I had a great opportunity to talk with Phil Nesmith about his process, projects and thoughts about plates. 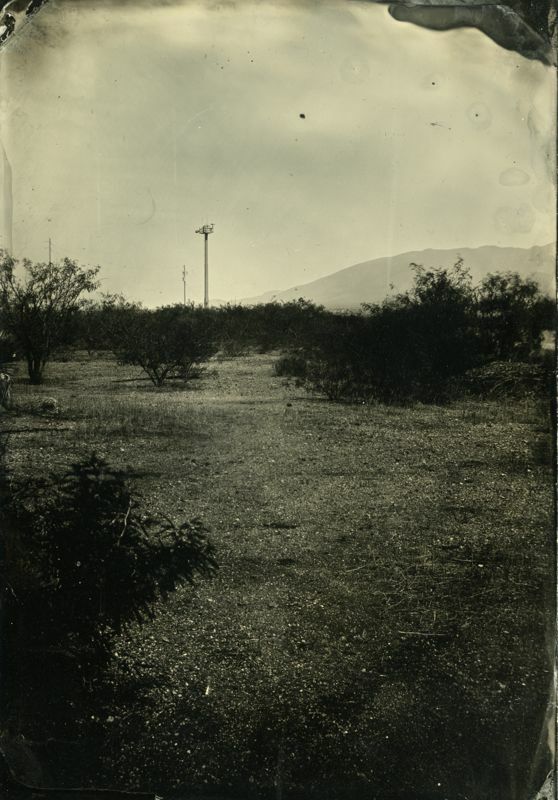 Abigail Smithson: Using one of the first forms of photography to document a location that is often a subject in today’s news cycles, do you think the aesthetic matches the contemporary importance of the location? How does the medium lend itself to the subject matter? Phil Nesmith: To tell you the truth, I am really not so sure how important the location is. At least not in the way that self-serving politicians and corporate news agencies like to make it. It is a place and situation that lends itself to the cultivation and reinforcement of fear by many. This is really the inspiration for the project in many ways. I introduce historic processes to contemporary events such as war, environmental disasters, etc. as a way to simultaneously tug the past into present and push the contemporary back into the fog of memory. Everything that I photograph has happened before in some fashion and will happen again. The process is directly tied to the concept. It is not an aesthetic gimmick for me. There must be a historical connection between the process and the event/location I am attempting to work with. 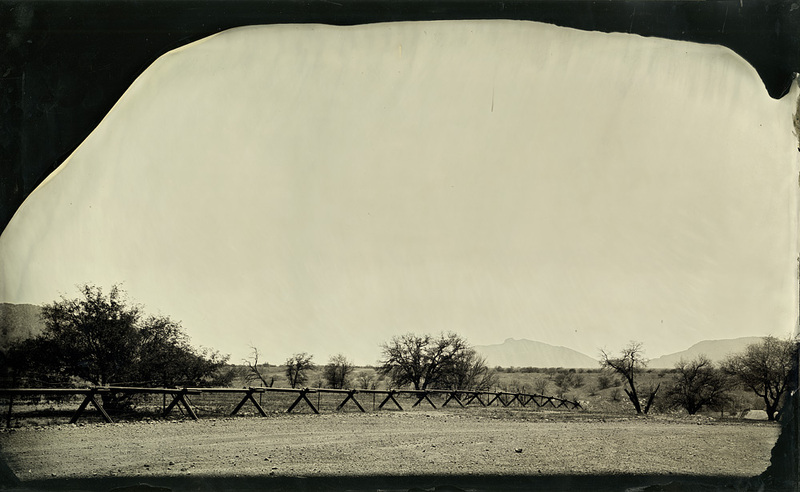 For “Line of Sight” specifically the historical connection is the fact that the wet collodion process was the rising star of the photographic world when the Gadsden Purchase was made in 1853-4 , which set down the line that the U.S. has been fortifying (with greater urgency) since 9/11. 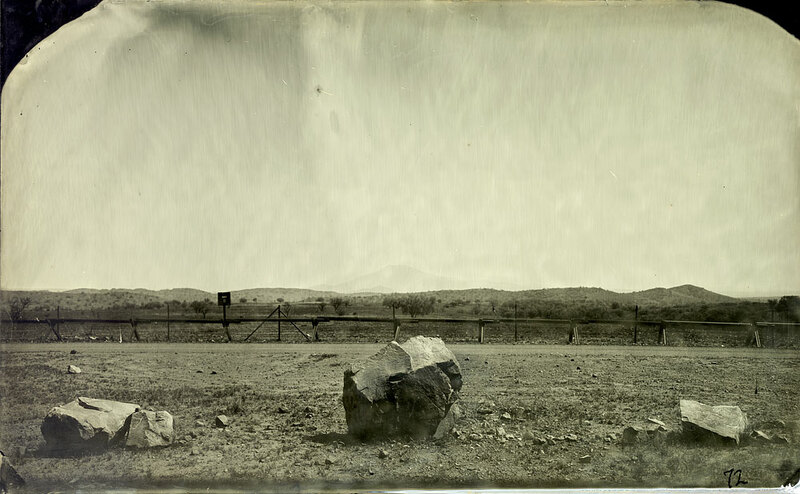 The use of the process to record the western landscape by the great post Civil War survey expeditions beginning in the 1870s set the historic visual record as well as the working method I wanted to emulate for my own survey. As for matching the importance of the location, I totally know that it does. How better to respect the importance of a location or situation than to spend hours, upon days, upon weeks, immersed in the place to create a handful of unique one-off artifacts that have been directly impacted visually by the environment itself? The grain of sand stuck in the varnish, the ridges in the collodion ,the pour pattern influenced by extreme low humidity, the mark cased by a small twig falling from a mesquite tree into the wash tray. If the place/event is truly important then the meditative process and viewing experience of the results seem spot on. It is difficult to make sensational images on plates. Take away the ability to freeze motion and the results immediately become less nightly news-entertainment and more philosophical. AS: In what time period were the plates shot? PN: The plates for “Line of Sight” were created during June and July of 2012. It was a daily operation with active image making happening from four hours to around ten hours per day depending on weather and travel times. Some images required travel distances of 200+ miles (round trip) from my staging area. Can you imagine that much travel knowing you have enough supplies on board for only four exposures? It is a rough day when things do not work out and you return with nothing but dirty glass, buckets of waste-water and empty fuel tanks. AS: How did you decide on this particular area of the border? PN: I chose land I was very familiar with, which I hoped would help to obtain results fairly quickly. I had previously lived in the area I chose to work in for ten years. My own history with the place gave me a mental catalog of locations, activities and environmental and terrain expectations . I needed just a short time on the ground to bring myself up to date. I only had a two- month window and because working 2000 miles from home is expensive, I wanted to cut down on the area reconnaissance time that would be needed. It takes me a long time to start to feel a place. Even with my history in the area I chose to work in, I still found it took a while to catch that flow, for the relationship to really work. The location was also beneficial because it presented a variety of terrain and surveillance activities in a relatively small area of around 200 to 300 miles (round trip distances) east and west along the boundary. The area also allowed for great vehicle access, which was satisfactory prior to the Bush administration border improvement initiatives but had been greatly increased after the National Guard engineering operations of 2007/8/9. AS: Was there any red tape you had to get through while shooting in this area? PN: None whatsoever. All of this work was created on public lands. As a courtesy to the Border Patrol I often stopped the first patrol I saw to inform them of the area I would be working in and how long I planned to be there. This was only needed during the first day of working a new sector as they became very familiar with my activities in the areas I chose to work. I had plans to work some restricted sites at the end of the eight week run but serious technical issues in the first weeks pushed everything back and I chose to stick with open areas. I would like to get back to work the more restricted stuff someday soon. AS: How do viewers respond to the older looking aesthetic? PN: I think that it is a bit different now than it was seven years ago when I first started working this way. In the beginning of my relationship with these methods, it was not very common in the gallery setting except for the work of Sally Mann, Rob Kendrick and a few others. I think that the explosion in the wet collodion workshop opportunities in the past few years says a lot about what people think about the look. How you apply that look is where it gets tricky. The majority of the reaction is very positive and the mixing of the historic aesthetic with contemporary events draws the viewer into my work. The combination of the visual signature of hand ground optics in the vintage lenses and the characteristics of the chemical side produce an effect that can really get a viewer to slow up just enough for their imagination to take over. Obviously the image needs to be engaging, but once the viewer gets closer they are treated to some really wonderful details, not only in the resolution of the image but the physical details of the plate itself. It is not exactly the same thing as seeing a painting in person that you have only seen in print, but in general terms the difference in experience is very similar. We are bombarded by so much visual noise now, and so much of it is absolutely perfect and machine made that coming across something from another time can really work well. If I had my choice I would never show any of my work in a digital form, but in today’s world things must be living on the web someplace, it is just not the same viewing experience. The fact that the majority of people who come into contact with my work only ever see it in a digital form saddens me. But I need to acknowledge that the majority of people who view my work do so because the plates are digitized. AS: Why do you think there has been such a resurgence of interest in wet collodion in the past few years? PN: In recent months the first apps to mimic the look of wet collodion have emerged and for me I am in a constant battle about leaving the process behind even though I am very specific about how and when I apply it. New tinype studios are popping up in different cities and most workshop providers are now jumping on the bandwagon. A growing number of commercial oriented photograhers have a “wet plate” section on their websites and a few have started digital-to-plate services. Initially the only people in any numbers doing this process were mainly the Civil War reenactor folks followed by a few artists. The mass abandonment of film for the promised instant and infinite ecstasy of digital image making seems to be the main driving factor. Along with the resulting collapse of the film/paper production industry. It is a way of image making that is not dependent on one company to produce the materials needed which is nice for those who have lost their favorite films and papers forever. Many have wanted to return to making something tangible with their hands again, but the numbers of people getting into wet collodion who have never known anything other than digital is also very interesting. It is happening at a fast clip from what I see in some of the Facebook groups. But the manual labor and the ritual aspect of the process is a secondary experience to the visual one, which is usually what pulls people in initially (especially for those seeing plates in person). It is clear that it is not digital and not of this time. In every aspect. This time warp ability and the physical details draw people in. One thing I like to point out is that digital technology is often cited as killing off so much of traditional photography. But it is the reason wet collodion has come roaring back. An example would be the availability of technical information online. Seven years ago, you had to learn this process from someone directly or do lots of research at the library (or multiple libraries) to find vintage information. Sourcing the materials and making equipment also took time. It took me about a year or so to get going. Now there are TONS of videos on the web. People are providing DVD tutorials, etc. Virtual wet collodion communities on Facebook provide a level of access to practitioners that was unheard of just a few years ago. Small business are now providing ready made and custom equipment and gone are the days of needing a full lab to get going as all of the chemicals can now be purchased premixed in kits. This is all available because of the Internet. Those trips to the library or used books stores looking for vintage books with the secrets of the past? 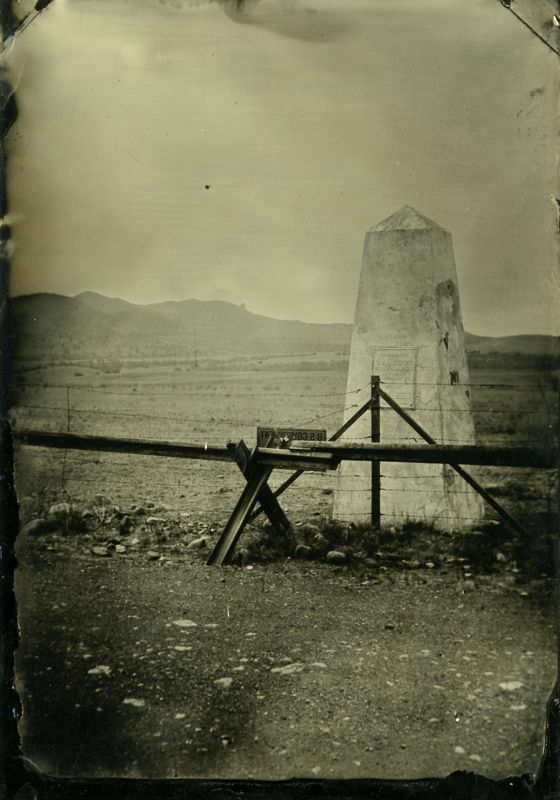 They are no longer needed as a well written and useful selection of wet collodion books have been digitized by Google. This massive level of information and collective experience makes decent results much easier than before. AS: The images hold a placid feeling, like the calm before the storm. Almost an eerie stillness. Did you pick up on that feeling while you were shooting in the area? PN: I am happy to see that you have that feeling because it is exactly what I was tuned into. It is hard to describe when to know it is time to set up all of the gear and give it a go, but there is this a switch that gets flipped. The air is just right, the smells, the sound of the rocks under my boots, the scent of ether all combine with the visual information and sets things in motion. “Eerie Stillness” comprises most of my memories about many of the locations I chose to work. The stillness does, at times get suddenly shattered by low flying helicopters. The artifacts of past events that can be found add to that uneasy stillness by reminding you of the histories the landscape has been a part of and a witness to. AS: Did you feel very isolated while you were shooting? PN: The short answer is yes. I work alone and although there are some serious safety and logistical considerations that must be made from time to time, it is how I seem to be most productive and comfortable. The few times I have had people around for parts of projects, I find it difficult to find what I call “the flow”. I need the isolation to sync my desires with what is actually there before I can attempt to create something with it. Over the course of a challenging project like “Line of Sight” there does come a time when I could use someone around to assist in attempting to remain sane as the problems mount, time and supplies dwindle away, and the daily exposure to the harsh conditions take their toll…but maybe it is when that tipping point is reached that the best work gets made. At least historically that seems to have been how all of the field based projects I have done work out. To see more of Phil Nesmith’s work, click here. Thanks for reading!